This combination of two classics works up quickly into the perfect blanket for a little one. With nearly infinite possibilities in choice of yarn and colors, you’re sure to create a blankie that will be carried and cuddled for years to come. 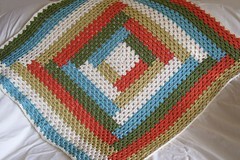 This is a *crochet pattern* in .pdf format (and U.S. notation) for making one of the blankets pictured. You’ll also need around 1200 yards of a soft worsted weight yarn, a size H (5.00 mm) crochet hook (or yarn and appropriate hook of choice), a tapestry needle for weaving in your ends, and a safety pin or scrap of yarn for marking the right side of your work. The finished blanket is approximately 36 inches (91 cm) on each side. I started making these, from your pattern, a few weeks ago and I’m totally in love with this pattern….in fact, I have four on-going at the moment! 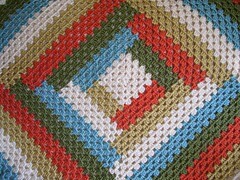 A wonderful, quick and easy pattern and the color possibilities are so much fun!